Observation - Flesh Fly - UK and Ireland. 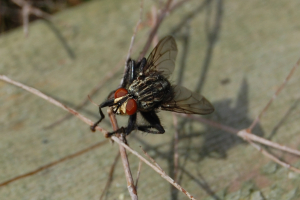 Description: Stripy fly,large feet and red eyes.Lays eggs in dead meat.About 10mm. Stripy fly,large feet and red eyes.Lays eggs in dead meat.About 10mm.